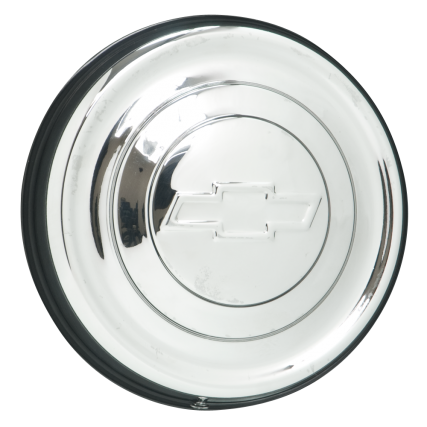 This is a 1952 Chevrolet Cap with a 7.0" back diameter with a nice Stainless Steel finish. These 1952 Chevy hubcaps 7.0" back diameter fit our Chevy Rallye wheels and 17"-18" Smoothie wheel sizes. Please check your actual wheels for the required cap fitment size. Coker Tire Company offers a huge selection of aftermarket hubcaps and wheels for collector vehicles. Do these fit the hot rod steel wheel? I am looking for the right set of steel wheels, caps and wide whites for my 55 Chevy. Your advice is appreciated. This cap fits the Smoothie Wheel, but Hot Rod Steel wheels require an 8 1/4" diameter cap. For assistance with your tire/wheel package, contact us at 1-800-251-6336, or support@coker.com.